The Democratic challengers to President Trump raised tens of millions of dollars in the first months of the 2020 presidential campaign, with Senator Bernie Sanders setting the pace for the field, with $18.2 million raised. As always, it is important to remember that winning the money race is not the goal itself but a means to an end: building a sustainable and effective campaign for the party nomination and, eventually, the White House. But the disclosures were the first peek at what kind of campaigns the leading Democrats are constructing, with fresh investments in digital advertising, big rallies (Senator Kamala Harris’s campaign spent about $500,000 on her splashy kickoff in Oakland), and staffing nationally and in the early states. Senator Elizabeth Warren has amassed an eye-popping staff of more than 160 — spending a higher share of what she raised than any other campaign. Whoever emerges will face a far more professionalized and better funded effort than the one that Mr. Trump led in 2016. In the first three months of the year, Mr. Trump raised more than $30 million and had more than $40 million in the bank. He and the Republican Party added another 100,000 small donors. Ads on sites like Facebook and Google were the top expenditure for multiple campaigns. Why? In part because the nature of running for president is changing. And in part because the Democratic Party has made having 65,000 donors a gateway to the first primary debates, so campaigns are fishing for new donors online. Mr. Sanders spent $1.5 million on digital ads. Ms. Harris spent $1 million. And Jay Inslee, the governor of Washington, plowed more than half of everything he spent into online ads: $450,000. Beto O’Rourke, who entered the race only in mid-March, still managed to spend more than $1.25 million on digital ads. And Senator Amy Klobuchar’s biggest expense was paying a digital firm $625,000 for “list acquisition” as she pursues the 65,000-donor threshold. Mr. Sanders came out of virtually nowhere to become a fund-raising phenomenon in 2015. And in 2019, Pete Buttigieg, the mayor of South Bend, Ind., has burst out as the surprise darling of donors, both big and small. He raised $7 million, despite beginning his campaign as more of an asterisk in a crowded contest. The pacing of his larger donations charts his rising momentum: He raised $100,000 from people who gave more than $200 in January, $312,000 in February and $2.125 million in March, most of it after his breakout town-hall performance on CNN. Mr. Buttigieg seems to have gotten more for his money than anyone else. He spent less than $700,000, a microscopic 9.66 percent of what he raised, which is known in the political world as a campaign’s “burn rate.” It is a closely monitored figure to determine who is spending most efficiently when the first voting in the Iowa caucuses is still nearly 300 days away. So just how little did Mr. Buttigieg spend? Well, his single biggest expense — nearly $275,000 — was simply processing fees for the deluge of online donations he received. His level of spending was more common for a run-of-the-mill congressional candidate than a surging presidential hopeful and a testament to the power of earned media coverage (see: Trump, Donald) in the modern moment. Fittingly, Mr. Buttigieg spent Monday evening on MSNBC in prime time speaking with the network’s star host Rachel Maddow. As Mr. Buttigieg spent less than a dime of every dollar he raised, Ms. Warren spent nearly 87 cents of every dollar she raised. Ms. Warren, who entered the race on New Year’s Eve, raised $6 million and spent the most of any Democratic candidate in the first quarter. Her $5.2 million amounts to a big and risky bet that early investment and organizing in the states that will begin the nominating contest — Iowa, New Hampshire and South Carolina — will pay dividends next year. Ms. Warren’s report showed more than 160 people on payroll — nearly double that of Mr. Sanders, even as he raised three times as much as her. Ms. Harris, the No. 2 fund-raiser, had 44 people on staff. Ms. Warren spent nearly $1.9 million on salaries, payroll taxes and insurance in the first quarter. Ms. Warren also transferred $10.4 million from her Senate account, giving her a financial cushion. But such a transfer happens only once. If there was any lingering doubt that Mr. Sanders — who raised $230 million in his losing 2016 bid — is the financial front-runner in the 2020 primary, the new report should lay it to rest. Mr. Sanders not only raised 50 percent more than any other candidate, but he also entered the race with the most money in other federal accounts (about $14 million) that he could spend in 2020. He had, by far, the most donors at the start of the race, and 525,000 people have already contributed to him. And he raised the largest share (about 84 percent) from those who gave less than $200, and thus can give more again and again. Ms. Harris raised the second highest amount, $12 million. And despite Mr. Sanders’s advantages, Mr. O’Rourke’s campaign touted, loudly, that he actually had out-raised Mr. Sanders in his first 24 hours as a candidate: $6.1 million to $6 million. But the new federal disclosures show that Mr. O’Rourke relied upon a bit of accounting finesse to score that headline: Nearly $300,000 of his first-day haul was actually general-election funds raised above the limit that he can spend in the primary contest. Many strategists believe the eventual nominee is going to need to appeal to both ends of the donor spectrum. Ms. Harris and Mr. O’Rourke both flashed that ability. Ms. Harris raised $4.2 million of her total haul from donations of less than $200, after spending the last two years building a powerful email fund-raising list, and $7.6 million from larger contributions, with a donor list flecked with famous names from Hollywood (J.J. Abrams and Ben Affleck) and the business world (Eli Broad and Sam Altman). Of the nearly $9.4 million Mr. O’Rourke raised in less than three weeks, $3.8 million came from larger donors and $5.5 million came from those who gave less than $200. The fund-raising leader board mostly mirrored those who fared best among small donors. The five candidates who raised the most money were the same five candidates who raised the most in small donations. 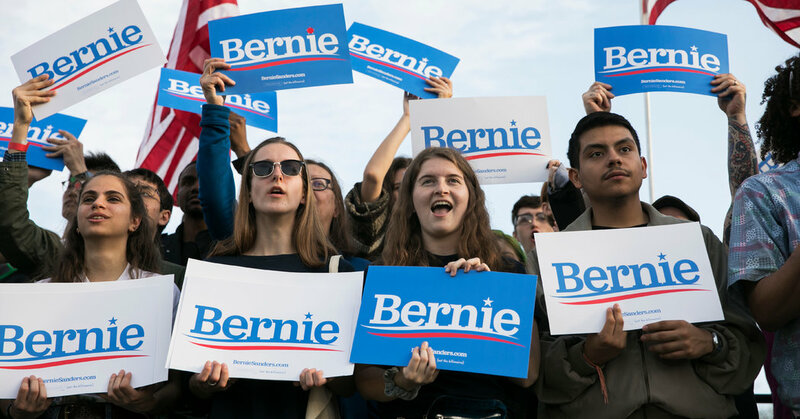 Numerous Democrats have positioned themselves as champions of a “movement” after Mr. Sanders’s success in 2016. After his 84 percent, those with the biggest share of funds from small contributors in the first quarter were the political newcomer Andrew Yang (81 percent of his $1.7 million) and Ms. Warren (70.5 percent of her $6 million), who swore off big-money fund-raisers in a risky gamble. At the other end of the spectrum was the former governor of Colorado, John Hickenlooper, who had the lowest (10 percent) share from small donors, followed by Senators Kirsten Gillibrand (17 percent) and Cory Booker (18 percent). Ms. Harris was the clear favorite of larger contributors — the $7.6 million she raised from those who gave at least $200 was, remarkably, nearly $3.4 million more than her closest competitor in that category, Mr. Booker. Mr. O’Rourke and Ms. Klobuchar were the only other candidates to top $3 million among such contributors. The biggest donor of the quarter was John Delaney, a former Maryland congressman who invested $11.7 million of his own money into his candidacy and has $10.5 million on hand. Firmly atop most polls, Joseph R. Biden Jr., the former vice president, has delayed joining the race so far. But if he enters the 2020 contest in the coming weeks, as expected, Mr. Biden will begin well behind financially. No fewer than nine candidates ended the first quarter with at least $6 million. Some quick and foreboding math: If Mr. Biden were to enter the race by May 1, he would have to raise roughly $100,000 every day through June 30 just to match where the ninth-best-funded candidate stood at the end of March.